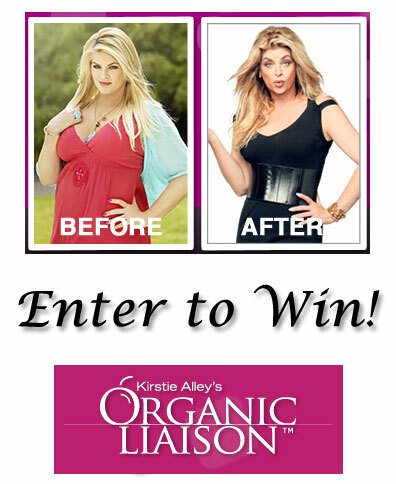 Win Kirstie Alley Weight Loss System Organic Liaison Giveaway! How to Look Like Kirstie Alley & Win her Weight Loss System Organic Liaison! No matter the size, I have always thought Kirstie Alley has been absolutely gorgeous! When she walked the catwalk at the Zang Toi fashion show in that absolutely stunning gown, it proves she’s still got it! The cobalt blue embellished gown was just gorgeous… just gorgeous! Tired of yo-yo dieting? Tired of hanging on to those old pair of jeans only to never seem fit in them? Well, why not try this brand new weight loss system proven to help you lose weight safely and effectively! And make you feel and look the way you have wanted to for years! Kirstie Alley’s Organic Liaison is a brand new weight loss program with the goal of “liaising” you from conventional eating habits to a healthier organic diet while you lose weight. Organic Liaison is a weight loss and diet plan that offers organic weight loss products, natural dietary supplements, and access to online diet and exercise tools to help you lose weight safely and effectively, all while having fun! This special Rescue Me Kit contains Rescue Me Weight Loss Elixir – the first USDA Certified Organic weight loss product. Rescue Me Weight Loss Elixir helps reduce cravings and appetite by providing vital nutrients to assist you on your weight loss journey. Worth over $150! The only mandatory option is to “like” us and Organic Liaison on facebook! Optional entries are obviously appreciated and make your chances of winning much higher! Entries open 10/07 through 11/01 at 12:01 am! You must be 18 or older to enter. Open Worldwide! We are in no way sponsored or endorsed by facebook. Organic Liaison provided the product being given away, but all thoughts are our own. Thank you to Organic Liaison for providing us with this great giveaway package! To enter to win, please use the rafflecopter entry form below. You may need to click “read more” to view the entry form. Please allow a few moments for it to load. Watch the Giveaway Bandit (the red Angry Bird) and his Grandma-ma (Winne the Witch) tell us about the great giveaway! We know Kirstie Alley has a great personality and is extremely funny, so we wanted to do something a little more unique with the video. Besides, the Bandit and his Grandma-ma got a fun reason to dress up and talk funny. I would so love a shot at winning this! Sure hope I win!!!! 🙂 I need to lose about 80 lbs!! I AM Bringing this Organic Liason prize into my sphere of prosperity! I AM getting more fit & healthy! Thanks Kirstie for more inspiration & hope! I just love Kristi, she looks amazing. I need to loose about 75 pounds for myself of course. Great idea!!! =) I’d love to win Organic Liaison. Kristi is very inspiring… I’m looking to lose about 30 pounds… this would be awesome! Thank you so much for the opportunity to win! This would be great..i am currently on a mission to loose 130..I want to loose 90 of it by May. I can REALLY use this! Go to the video on You Tube, Underneath is a little rectangle that says Add + inside. Click that box a list will appear, click Favorites. I’m overdue to lose some weight! I love Kirstie Alley and I have admired her beauty and personality over the years, and it would be awesome to win this contest and prove to everyone that it was her product that helped me loose this weight that I have been carrying around for so long. I need some help losing some extra poundage. Oh man how I could so use this 🙁 I’m at a point where I’ve got to do something but have no real direction on what to do, even though I’ve tried it (almost) all! Good luck every1! Hope I win this. Mayb it would help me get past this weight loss plateau. I would LOVE to win this to help with losing the baby weight after having baby #4. You guys are too funny…and seem to have a great time with this video!